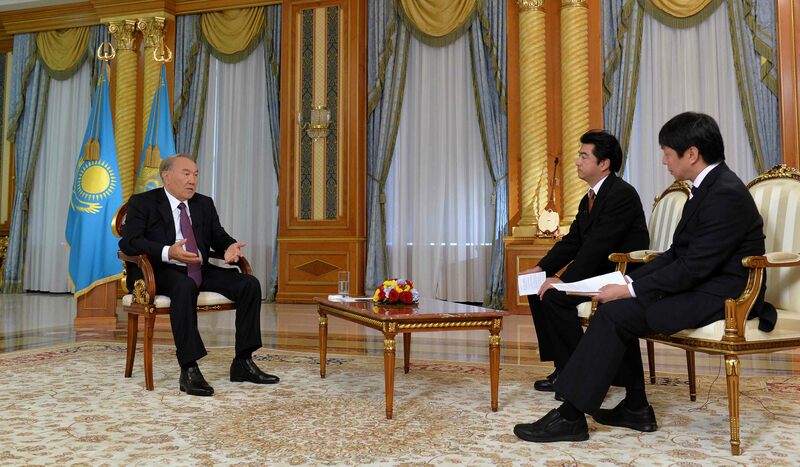 Head of State Nursultan Nazarbayev made outspoken remarks regarding Russian-Japanese relations during his interview with NHK (Japan Broadcasting Corporation) and Kyodo News Agency. The Akorda's press service posted the video of the interview on its Facebook page, Kazinform reports. "I see that negotiations are underway. I know for sure that [Vladimir] Putin wants it. Russia wants to have trust-based relations with Japan. There is this ongoing Kuril Islands dispute. Many countries have such unsettled issues which can be solved in the conditions of good relations... If Russia builds good economic ties with Japan, enters into the treaty on friendship and mutual trade, that and other issues will be solved... There are other players who didn't want Russia-Japan rapprochement. But they are moving in the right direction," said President Nazarbayev. According to the Akorda's press service, during the interview Nursultan Nazarbayev answered some questions related to Kazakhstan's efforts in the sphere of nuclear non-proliferation and disarmament, especially highlighting the reasons that affected its decision to abandon nuclear arsenal. Additionally, the Head of State touched upon the prospects of interaction between Kazakhstan and Japan, including bilateral cooperation in nuclear disarmament. Nursultan Nazarbayev also told about Kazakhstan's role in regional geopolitical processes and its socioeconomic development. NHK (Japan Broadcasting Corporation) and Kyodo News Agency are the leading mass media in Japan and in the world.